With dedicated computer programs and specialized apps many cyclists today obsessively track the miles and hours spent on our machines, machines themselves usually designed and often fabricated using computers. Most of those bicycles, generally carbon and generally black, are indistinguishable to look at and, in spite of a panoply of brand names and models, originate in one of only a handful of huge Asian factories. In Italy, the Promised Land of Cycling, a small group of framebuilders have never stopped providing the kind of personal attention once found in so many fields of commerce. Even those that have grown into global presences in the racing bicycle market at least offer token recognition of their past by offering a traditional steel frame--Colnago, Cinelli and Pinarello come to mind. But to immerse yourself in the real traditions of Italian road cycling and yet reap the benefits of what the high-technology folks refer to as “the man-machine interface” it is time to visit the beautiful province of Tuscany and the modest but impressively capable workshop of Irio Tommasini in Grosseto, close to Siena, the fabled town so beloved by all travellers. Although not far from the coast, Grosseto probably does not draw a lot of tourists and certainly almost none of those go to the nondescript industrial park on the outskirts of town. Here on the Via Neapal one finds a typical large bike shop, handling a number of brands and types of bikes, and run by the founder's daughter Roberta and her husband Valfrido. However, behind this store is found the heart and soul of the operation, the workshop (for this “factory” is a description too grandiose and yet too belittling). The workshop and the promotion of the Tommasini brand are under the supervision of the founder's other daughter, Barbara, and her husband Alessandro. Irio Tommasini was born in Grosseto 80 years ago and began his life as a framebuilder under the supervision of Giuseppe “the Magician” Pelà in 1948 while working at a large factory in Milan. Pelà was a highly respected builder but as he usually built for other people his own name is seldom seen on a frame. 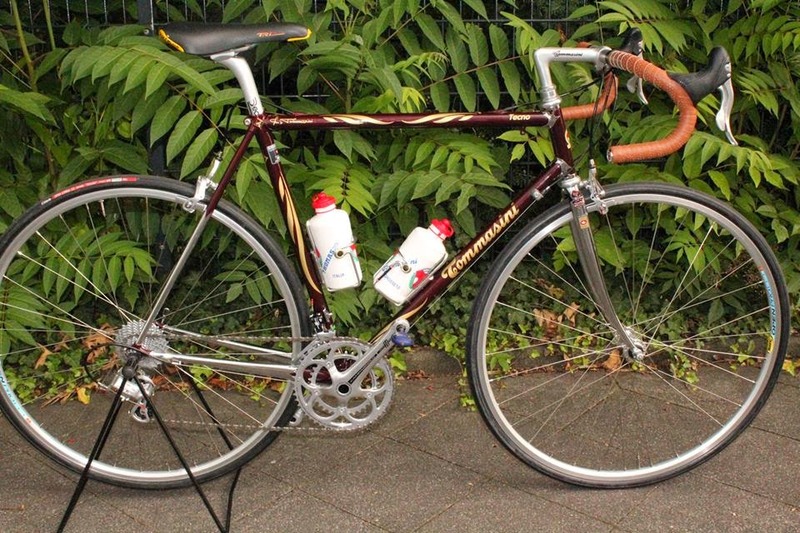 Tommasini worked closely with him, including on weekends, and learned to improve his own craft. At the factory he worked in the Racing Section and turned his hand to whatever was necessary, working not only on bicycles but on the motorcycles produced by the firm. At that time in Italy it was necessary to be in the north for this kind of exposure to manufacturing; the relocation to Grosseto would come later but he had already started to build bicycles that would be raced by champions, such as the first three-time Tour de France winner, Louison Bobet. Tommasini continues to come to the workshop, occasionally taking up the brazing torch. He walks with a cane and jokes about his weight but he remains very focused on his art. In an interview he spoke about changes in the bicycle industry he has seen since setting up on his own in 1957. Italy was unbeatable in the quality of its production and while attempts were made to copy the work in other countries there was limited success. Tommasini himself began exporting to the United States in 1973 and said that there was not much happening in racing bicycles there until around 1985-1990 (although he did make a positive reference to the work of Richard Sachs) when the interest in serious bicycle construction began to grow but there were also some poor designs reaching the market. The limiting issue was in finding qualified personnel and Tommasini worked with American firms, such as Litespeed, in training technicians. As new materials were introduced to the sector new skills were needed for a different kind of manufacturing, no longer framebuilding in the traditional sense. Tommasini feels that the while the Italian strength was in custom building, the Americans had a better understanding of the requirements of marketing and he emphasized the difference between commercial and technical needs. For example, in a tailored frame there are 40-50 measurements that need to be considered and precise dimensions calculated for a perfect fit whereas to reach the widest commercial market large companies simply size frames like shirts, S-XL, with approximate fit through stem and seatpost positioning. Large companies are able to sponsor pro racing teams as a key part of their marketing, an option not available to small builders however excellent their product. Nonetheless, in the past Irio Tommasini built bicycles for some of racing's most noted riders, including multiple World Champions such as Belgian Freddy Martens and local heroes Mario Cipollini and Paolo Bettini. After a friendly welcome (with espresso, of course!) entering the workshop finds you in what is essentially a machine shop, a plain environment with various tools for cutting, milling, grinding and polishing. But this is deceptive since the five man team (the most recent member of which arrived in the 1970s!) that produces around 1600 frames annually does so in a surprisingly diverse range: you can have a Tommasini in your choice of chromoly steel, stainless steel, aluminium, titanium or carbon! There is an impressive shelving unit holding tubing of different profiles in all of these materials, which are ordered from Columbus to Tommasini's custom specification. Interestingly, stainless steel is considered one of the most difficult materials to work with and is priced at titanium frame levels. Although Irio Tommasini himself claims to prefer carbon for its stiffness and lightness he notes that steel's comparative softness makes it more comfortable to say nothing of its longevity. Around two-thirds of the firm's output is in steel, with the majority of these frames being the Tecno model made with Columbus Nemo tubing. The workshop produces matching Columbus Air forks as well. There is no additional charge for custom geometry for the Tecno and Tommasini said that a major percentage of the customers ordering this frame do come to the workshop in Grosseto for a personal fitting. 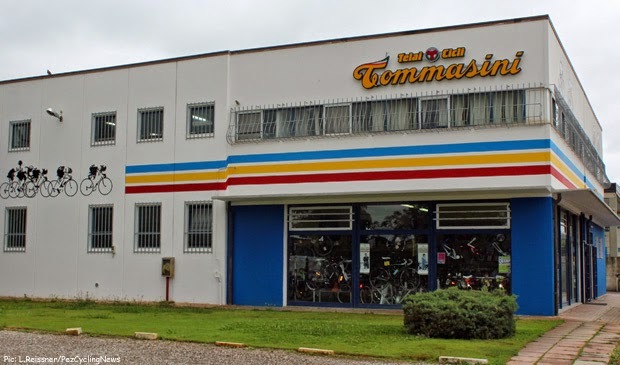 Tommasini ships many bicycles to Japan and is active in the UK and German markets as well as having a distributor in the United States. The construction of a Tecno begins the client climbing the stairs to the upper floor office for a comprehensive measurement on a fitting device. If you are fortunate Signore Tommasini will do the measuring and he is painstaking in his precision (and not above remarking on the customer's weight or flexibility!). Various positions are considered and all is marked down on a sheet of paper: body size, leg length, knee position, seat. In my case, lack of flexibility called for a 115 mm stem, which is not manufactured, so an adjustment to the top tube would be made, giving it a barely perceptible slope so that a standard 110 mm stem could be used. At no point does the expert actually ask you how you want to use the bicycle and it is apparent that in the view of Tommasini (not alone amongst custom builders) that fit is everything and that if the bike is perfectly sized it does not matter what you do with it. You are receiving the wisdom of nearly seven decades of experience and while the benefits of a custom frame may not be apparent to a very occasional rider the more one rides such a bicycle the more one is aware of its ride qualities. Entering the data onto a computer, the information for this Tecno makes its way to the workshop where from the shelves components are selected—top and down tubes; seat- and chainstays; headtubes; lugs; and dropouts-- and brought to the building area in shopping carts. The lugs are made to Tommasini specifications by a firm in nearby Siena. Tubes are precisely mitred, brazed in lead or silver, and exactingly checked for straightness during the whole process. For the sake of efficiency the bicycles are built in same-model batches but each is unique. There are many options that can be included, such as a chain hanger on the right rear seatstay or a traditional braze-on race number fitting for the real retro look. Dipped in acid to remove welding material, then in calcium to be neutralized, the frame is washed and sandblasted before final details are checked and if necessary corrections made by hand with a file. The entire frame is then chrome-plated before moving on to final finishing. Of course, one of the great pleasures of a custom bicycle is the choice in finishes. The Tommasini website has a number of suggestions but Paolo the painter will do anything within reason. Colour schemes can range from sober to excessive (there is still a chance to get that 1980s Italian “net” finish!) but almost everyone wants their name on the top tube. Delivery time from the placement of the order is generally around five to eight weeks. Around 70 percent of the customers order only frames although complete bicycles are available. There is a nice range of Tommasini accessories, including an engraved Cinelli quill stem, logo'ed bar tape ends, clothing and water bottles. The upper floor not only has the fit machine and the business offices but also the packing area where frames await their shipment around the world. The area is also like a museum dedicated to Tommasini's own history, with wonderful old photos and posters as well as Irio Tommasini's own excellent collection of vintage bicycles, including a Pelà as well as some of his own early bicycles. There is an exceptional 1952 Bottechia with the terrifying early Campagnolo use-both-hands-and-pedal-backwards-to-shift rear derailleur as well as an aged 1928 Legnano. Trophies and jerseys abound, including two framed ones from double World Champion Freddy Martens of the Flandria team. In an era when sub-6 kg bicycles are no longer the stuff of fantasy why would anyone buy a steel frame built with the same kind of technology familiar to Signore Pelà in 1948? Of course, this is not really true as the materials that Tommasini works with are the latest in steel metallurgy and will produce a bicycle of startlingly low weight undreamed-of by the old boys in Milan then. And steel continues to offer many benefits beyond that comfortable ride such as durability (rust is not an issue with even the most basic care) and, for those unlucky enough to need it, post-crash repairability. But forget that rational stuff. You want a bicycle like a Tommasini, a bicycle that is the result of decades of study, experience and passion, because it will fit you perfectly and provide absolute reliability when out on the road. Descending an alpine pass at high speed you can be confident and secure the bike will go where you point it. Add to this the exceptional craftsmanship of those five employees and the boss himself—the engravings, the filed lugs, the enamel headtube badge, the flawless non-black paint and chrome—coupled with a price for a unique item that in an era of big factory $3000 carbon frames being considered “mid-range” seems like a screaming bargain and you have an answer. And, as if any real cyclist needed one, an irresistible excuse to go to Tuscany. Viva la Bella Macchina! Great story! Larry was there last year and his friend's Tecno will arrive very soon. Not the only Builder in Tuscany, Daccordi also builds, As does Simoncini (where I work), Darren Crisp is here, and Ancillotti does mtb frames.